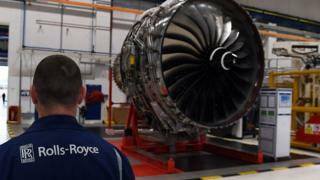 The Serious Fraud Office (SFO) has dropped its investigations into aerospace firm Rolls-Royce and drugs giant GlaxoSmithKline. The SFO said there was "either insufficient evidence" or it was "not in the public interest" to continue. GSK's probe concerned "commercial practices" at the company. SFO director Lisa Osofsky said: "After an extensive and careful examination I have concluded that there is either insufficient evidence to provide a realistic prospect of conviction or it is not in the public interest to bring a prosecution in these cases. "In the Rolls-Royce case, the SFO investigation led to the company taking responsibility for corrupt conduct spanning three decades, seven jurisdictions and three businesses, for which it paid a fine of £497.25m." The company admitted falsifying accounts to hide the illegal use of local middlemen, attempting to thwart investigations into corruption, and paying tens of millions of pounds in bribes to win business in Indonesia, Thailand, China and Russia. The SFO also confirmed that no individuals at Rolls face would face prosecution. Rolls-Royce entered into a deferred prosecution agreement (DPA) - a type of corporate plea bargain - with the SFO in 2017 to settle allegations of wrongdoing. But critics of Friday's SFO news that neither management nor individuals would face action described it as odd, given that the company accepted wrongdoing under the DPA. Jeremy Summers, head of business crime at law firm Osborne Clarke, said that the use of DPAs might need to be reassessed. "The system in the UK is based on relevant individuals also being prosecuted, and individuals can't get a DPA. That aspect may need to be looked at urgently," he told the BBC. He added that courts might in future be less willing to grant DPAs, noting that the supporting evidence was now viewed by the SFO as being insufficient to pursue a prosecution against the individuals. Meanwhile, anti-corruption campaign group Transparency International UK described the closure of the case as "absurd" and argued that justice has not been served. Robert Barrington, the organisation's executive director, said that "neither the bribe payers nor the management team that allowed the crime to happen" had been held responsible. "This case calls into question whether the SFO was correct to offer Rolls Royce a DPA," he added. In a statement, Rolls-Royce said it noted the SFO's announcement and would not be commenting on the decision. The fraud body's investigation into Glaxo, which began in 2014, focused on "commercial practices by the company, its subsidiaries and associated persons". The SFO said that following "a detailed review of the available evidence and an assessment of the public interest there will be no prosecution in this case". A spokesperson for Glaxo said the company was "pleased that the SFO have closed their investigation and concluded that no further action is required". Lisa Osofsky, whose tenure at the SFO began last August, has been conducting a review of the strength of its open cases. She previously worked at compliance firm Exiger, where she was a Managing Director, and as a federal prosecutor for the US government.